Use two people when removing or installing the front door assembly due to its heavy weight. When removing and installing front door assembly, support front door using a suitable tool. Do not use air tools or electric tools for servicing. 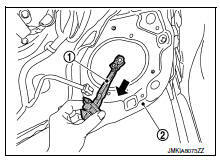 Before servicing, turn ignition switch OFF, disconnect both battery terminals and wait at least three minutes. LH side shown; RH side similar. Disconnect the battery negative and positive terminals and wait at least three minutes, if equipped with the side air bag (satellite) sensor. Refer to PG-50, "Removal and Installation (Battery)". Remove front door assembly harness grommet LH (1) then pull out door harness from body (2). Disconnect the harness connectors (A) from the front door assembly harness. Remove check link bolt (body side). 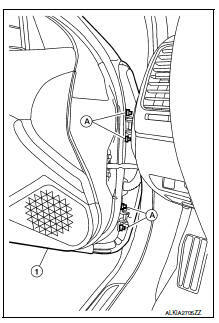 Remove front door assembly hinge nuts (A) (door side) and the door assembly (1). Tighten door hinge nuts to specified torque. After installation, check front door open/close, lock/unlock operation. After installation, perform the front door adjustment procedure. 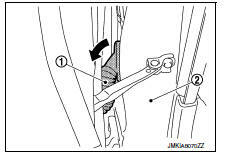 Refer to DLK-311, "DOOR ASSEMBLY : Adjustment". When main power window and door lock/unlock switch is removed or replaced, it is necessary to perform the initialization procedure. Refer to PWC-28, "Work Procedure". Check the clearance and surface height between front door and each part by visual inspection and tactile feel. If the clearance and the surface height are out of specification, adjust them according to the adjustment procedure. Remove the front fender. Refer to DLK-159, "Removal and Installation". Loosen the front door hinge to body bolts. Move the door forward or backward as necessary until within specifications provided. Tighten the hinge to body bolts to specified torque. Install the front fender. Refer to DLK-159, "Removal and Installation". Loosen the front door hinge nuts (a). Move the top and/or bottom of the door (1) in or out as necessary until it is within specifications provided. Tighten the front door hinge nuts to specified torque. 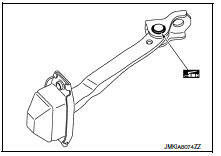 Check front door hinge rotating point for poor lubrication. If necessary, apply a suitable multi-purpose grease. After adjusting, apply touch-up paint (body color) to the head of front door hinge bolts and nuts. If the clearance measurements cannot be corrected by adjusting the front door assembly, adjust the following as necessary. 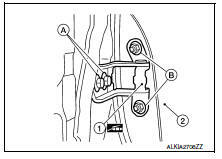 Front fender: refer to dlk-160, "adjustment". 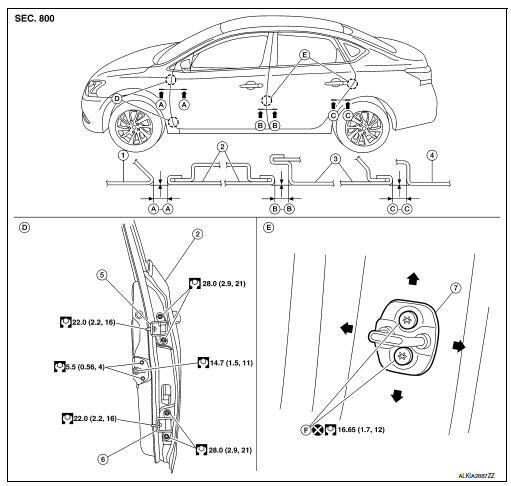 Rear door: refer to dlk-169, "door assembly : adjustment". Adjust front door assembly striker so that it becomes parallel with door lock insertion direction. Remove front door assembly (2). Refer to DLK-309, "DOOR ASSEMBLY : Removal and Installation". Remove bolt (a) and door hinge (1). Remove door hinge bolts (b) and remove hinge (1). Tighten front door hinge bolts to specified torque.Dlk-164, "door assembly : adjustment"
Apply anticorrosive agent onto the front door hinge mating surface. Fully close the front door glass. Remove front door speaker. Refer to av-60, "removal and installation" (base audio), av-205, "removal and installation" (display audio with bose), av-124, "removal and installation" (display audio without bose) av-408, "removal and installation" (navigation with bose) and av- 300, "removal and installation" (navigation without bose). Remove door check link bolt from body. Remove door check link bolts on door panel. Remove door check link (1) through the hole in door panel (2). 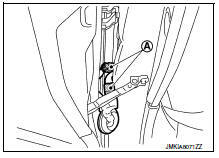 Check front door check link rotating point for poor lubrication. If necessary, apply a suitable multipurpose grease.